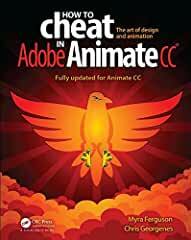 CRC Press has published How to Cheat in Adobe Animate CC, 1st Edition. Would you rather take months to learn every tool, every feature, and every concept in Adobe Animate or start right now making your own creations with just a few steps? Myra Ferguson is teaming up with Chris Georgenes to help you create great animation, bring objects to life with cool motion effects, and enhance your productivity in Animate CC!